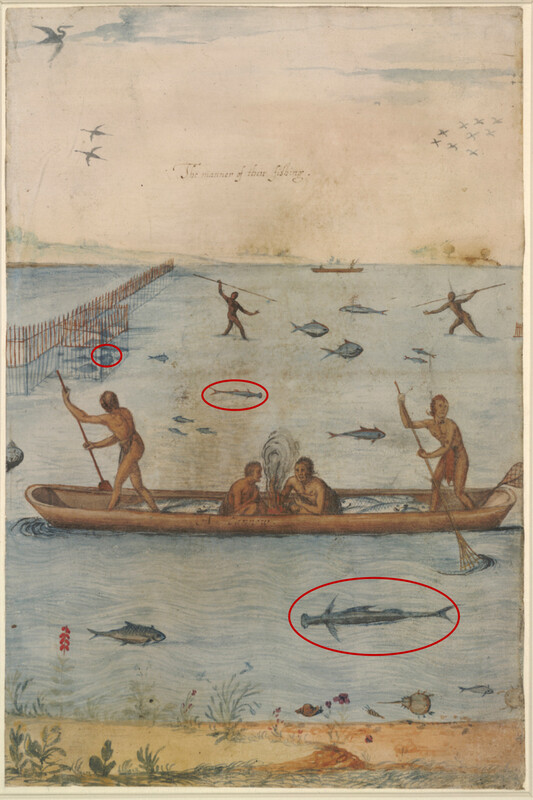 I’ve defaced this colonial-era image of Native American fishing methods from Roanoke Island, NC to show that sharks have been observed in North Carolina’s estuaries for quite some time. Original art: “The Manner of Their Fishing” by John White. It’s a bit of a cliché to reference the movie Jaws when talking about sharks, but I’m going to do it anyway. There’s a pivotal scene where the giant White Shark is spotted moving into a salt pond, where it proceeds to terrorize the children of protagonist Chief Martin Brody. While no sharks are in the business of regularly eating humans, at least part of this scene is realistic: sharks do make use of inshore, estuarine environments like lagoons, bays, and the lower portions of rivers. Despite the fact that sharks are generally thought to stay out in the ocean, many species are not only comfortable entering estuaries, they actually depend on them. Some species make extensive use of estuaries as shelter from predators and/or a place to grab a bite themselves. So it should come as no surprise that North Carolina’s Pamlico Sound, part of the Albemarle-Pamlico estuary (the second-largest in the continental U.S. after Chesapeake Bay) offers a lot of potential real estate for sharks. Unlike Chesapeake Bay, Pamlico Sound is a lagoon, which means it’s wide, shallow, mostly water, and connected to the ocean via fairly small inlets between barrier islands. It straddles the transition zone marked by Cape Hatteras between temperate and subtropical marine ecosystems, and the amount of seagrass growth there is second only to Florida in sheer area. This estuary is already well-known for its importance as habitat for such varied (as well as tasty and/or fun to catch) species as Blue Crab, Penaeid shrimps, Flounder, and Red Drum. However, the sharks of Pamlico Sound have mostly been known by scattered reports and sightings from fishermen. That is, until my co-authors and I were able to look through a nice data set to get an idea of which sharks are present in the sound and where in the estuary they might like to be. The results are now published in PLOS One, and here’s a quick summary of how we got them. Technology in water? That seems a bit counter-intuitive doesn’t it? Well, Dr. Kersey Sturdivant, during his undergraduate and graduate years, denied the golden rule of electronics and submerged a video camera under water. But this is not your typical Canon Powershot D10. As much as I love thumbing through magazines and flipping page after page of vibrant underwater pictures of colorful flora and fauna, WormCam skips the excess and gets right to the bottom. Literally. The video camera, modified from your average security camera, is set at certain time intervals and takes still pictures, as opposed to recording a video, for technical reasons. WormCam unveils the under-sediment realm. The images are not of mystical jellyfish and elegant fish nor the teeming micro and macro-zooplankton; rather the camera captures worms, crabs, snails and all things benthic. WormCam, a dense yet delicate technology, is encased within a waterproof, blade-shaped prism, which is attached to the side of a larger platform. The lead battery, also in a waterproof case, sits on top of the rectangular prism. Linking the two components together with a waterproof wire, WormCam is complete and ready to be deployed. Depending on the depth of the water, WormCam can either be deployed by hand in shallow waters or by rope in deeper waters. When held horizontally, the prism, where the camera is housed, protrudes below the bottom of the platform. Strategically designed, WormCam inserts itself within the sediment like a spoon sinking into yogurt. The camera is then peeking halfway beneath and halfway above the sediment. Through the clear, plexi-glass window, the camera snaps images of the water-sediment interface. Now, Dr. Sturdivant, other scientists and aspiring undergraduates can observe the happenings at the sediment-water interface for extended periods of time. You can too! Watch a movie from a WormCam deployed in the York River (if you look closely, the grooves in the sediments are worms wiggling around!). But the seafloor is stereotypically dark and unattractive. Why is this important and why should we care? Having the ability to observe sediment changes and sediment-organism interactions over time offers marine scientists an enormous advantage. For example, during eutrophication, the phytoplankton bloom is incredibly obvious, thanks to the single-celled organisms’ conspicuous chlorophyll. Studies have confirmed that fish and other organisms die because of the lack of oxygen, but what about the worms and other sea-dwelling creatures that live beneath our scope of vision? WormCam widens this limited scope. With WormCam, scientists can then begin to understand these silent creatures and their roles in the aquatic ecosystem. Bioturbation in a Declining Oxygen Environment, in situ Observations from WormCam offers more technical information on the application of WormCam. Thus far, WormCam has been deployed off of the Chesapeake Bay, Gulf of Mexico and Pivers Island. Each location has offered a benthic perspective on what is happening on and beneath the seafloor in the least intrusive way as possible. 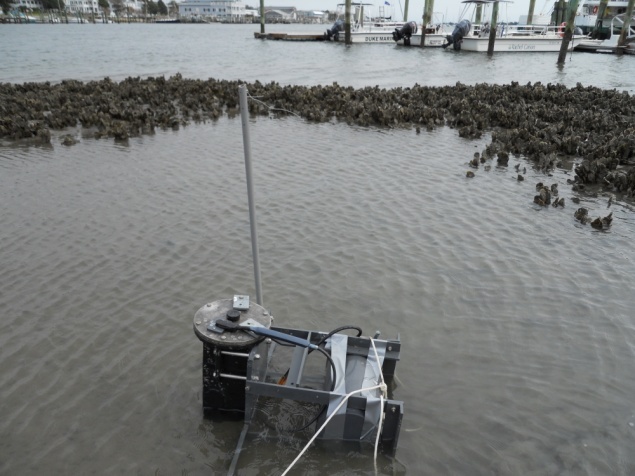 For example, the deployed WormCam off of the Gulf of Mexico has facilitated scientists’ understanding of the effects of Deepwater Horizon oil spill on sediment and benthic organisms. 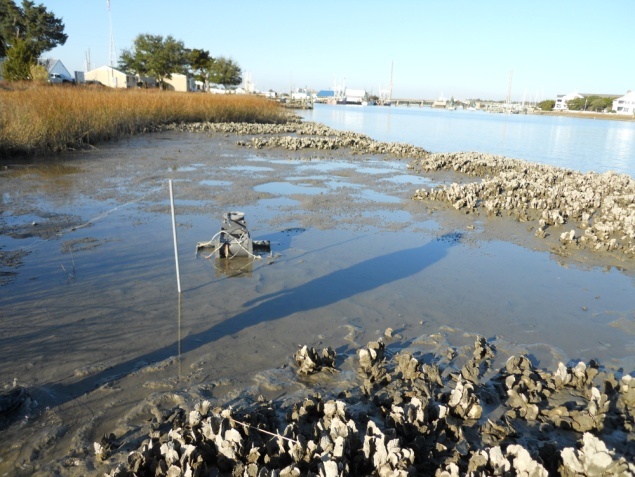 Currently, Dr. Sturdivant and I, one of the aspiring undergraduates, have deployed a WormCam off of Pivers Island. We want to understand how chemical cues from gastropods affect crustacean behavior as well as how the attracted crustaceans impact other species residing in the sediment. Some very interesting observations have been made, but there is more to come. It’s a good thing that WormCam has its very own twitter page. Follow @wormcam. Lucy Ma is an undergraduate who participated in a blog writing workshop led by Andrew Thaler. She works with Dr. Sturdivant on WormCam. There is a disconnect between those who conduct scientific research and those who consume it. The public has a vision of science that involves crisp lab coats and expensive equipment, lone students toiling at the bench waiting for an eureka moment or field researchers swinging, Indiana Jones-style through the jungle, Science is, unfortunately, not that neat.